Even though I love breakfast foods, we usually only eat breakfast on the weekends. We will sometimes have breakfast for dinner and my girls will occasionally grab a bagel or a piece of fruit on the way out the door. 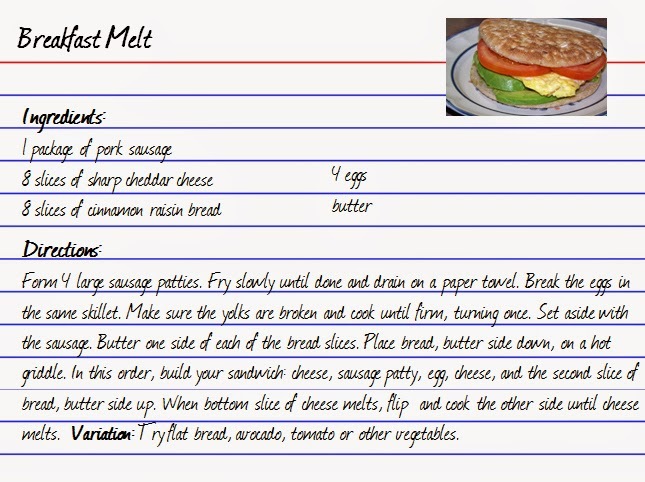 So imagine my excitement when I found this quick & easy recipe for a breakfast melt. It so simple and easy, it would even be perfect for a rushed school morning. Form 4 large sausage patties. Fry slowly until done and drain on a paper towel. Break the eggs in the same skillet. Make sure the yolks are broken and cook until firm, turning once. Set aside with the sausage. Butter one side of each of the bread slices. Place bread, butter side down, on a hot griddle. In this order, build your sandwich: cheese, sausage patty, egg, cheese, and the second slice of bread, butter side up. When bottom slice of cheese melts, flip and cook the other side until cheese melts. Note: Grape jelly is good added to the sandwich! Variation: Try flat bread, avocado, tomato or other vegetables.